As-salamu alaykum and hello everyone ♡. Hellloooooooo. I know I know. Its been almost a week with no new post! I am so sorry as I can't get myself together to really sit in front of my laptop and blog. Things has been getting more busier with stuff and also the projectB that I am working on. I really can't wait to reveal it. I can't promise anything as it takes so many of my time as I can see that I don't have time for anyone else. I feel so bad at the same time I feel so left out lately but well things need sacrifices right. I need to pursue my dreams first. Oh well. So glad I get to join some events. Thankfully the event was held after office hour so I can join in. 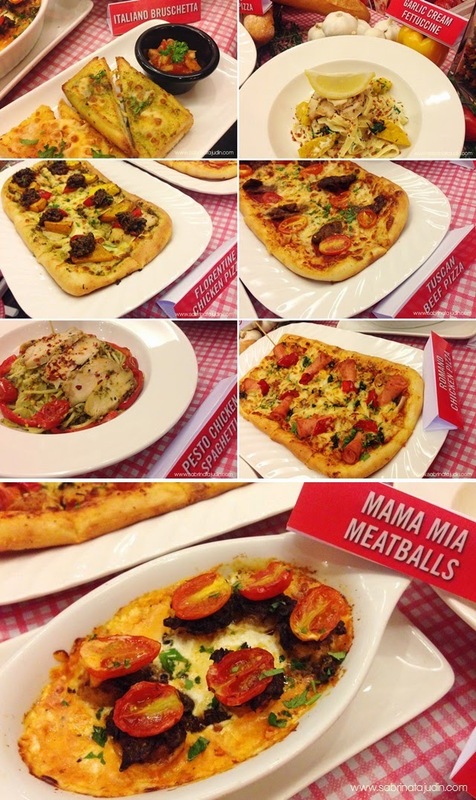 Last Tuesday I went to Pizza Hut Pavilion for a little blogger get together along with the launch of their new menu. Seven new menu were introduce that day and oh yes I am excited! Who does not love to eat! Pizza Hut said that when its made with passion, its always better. For me food always get people together. Featuring The Taste Of Itally. Pizza Hut focus on great tasting and Italian inspired, quality dishes which not only made with passion but also with the heart just like Italians do. Pizza Hut offers 3 types of flat bread, 2 type of pasta, meatballs and a savory type of bread for you to indulge. Now lets talk about the fooooddd! Jump down to the appetizer. Called the Italiano Bruschetta. Love love love this bread especially the tomato dipping that it comes with. Its so crunchy and just amazingly delicious! One of my favorites. There are 3 types of flat bread or I called it the rectangle pizza! I love pizza that is flat. This is definitely a thumbs up for me! Comes in 3 styles that is Florentine Chicken Pizza, Romano Chicken Pizza and as for beef lovers go for the Tuscan Beef Pizza. Now to my favorite. The pasta! Comes in 2 styles to choose from, Garlic Cream Fettuccine and Pesto Chicken Spaghetti. I love both! The last one which is Mr. T favorites, the Mamamia Meatballs. To all meatballs lovers and melted cheese lovers. You just got to try this one. Serve hot and as you dig in, you will pick up the meatball that is stuck in the melted cheese. How convincing I am. Yes, this is so goood! You must try! Look at Mr. T. He is now officially overwhelm by the love of the Italian goodness. We ate all 7 menus by ourselves. Haha! You can get all this in sets which is a great deal. And now we all are kenyang people who want to take picture some more with the food because we love it. Haha. Tahnk you Pizza Hut for having us. Now I am craving for the Pesto Chicken and the bread! Who want to belanja me? hehe. Now which menu droollls you? i wanna try the italiano bruschetta and garlic cream fettuccine!